First, it cannot be denied that the US media, taken in all its wholesomeness, has been overwhelmingly consistent in its ‘style’ of reporting on Donald Trump, the 45th POTUS. And by consistent I mean unprecedentedly critical, misleading and outright aggressive in its guerilla coverage of him. If one is not convinced by the gloom-and-doom Trump stories featured daily in the Yahoo News feed, then a study by the Media Research Center (MRC) should do the job. 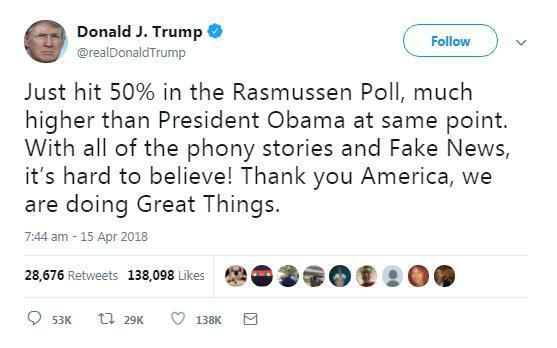 From January 1 through April 30, evening news coverage of the US leader - courtesy of ABC, CBS and NBC - were 90 percent negative, which is pretty much the same incredible average revealed by MRC one year earlier. The study looked at every one of the 1,065 network evening news stories about Trump and his administration during the first four months of 2018. Total negative news time devoted to Trump: 1,774 minutes, or about one-third of all evening news airtime. That’s pretty much the definition of a circle jerk. “Nearly two-fifths (39%) of the TV coverage we examined focused on Trump scandals and controversies, while 45 percent was devoted to various policy issues,” MRC wrote in its report. Meanwhile, the farcical Russia ‘collusion’ story was consistently the main grabber — clocking in at 321 minutes, or nearly one-fifth of all Trump coverage. Of the 598 statements MRC calculated about Trump’s personal scandals, virtually all of them (579, or 97%) came out of the media wash cycle tarred and feathered. If this represents an orchestrated attack on the Commander-in-Chief, and in light of those numbers it would be difficult to argue it isn’t, the strategy appears to be falling flat. Despite, or precisely because of, the avalanche of negative media coverage, Trump’s popularity rating smashed the 50 percent ceiling in early August and continues to remain high. 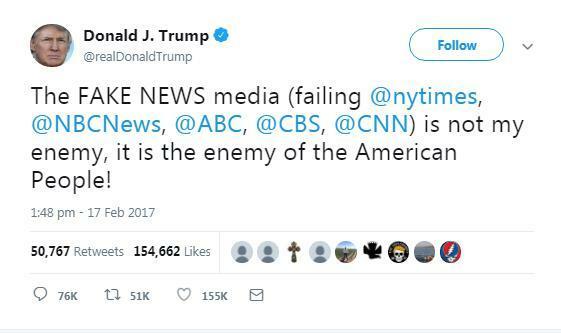 Although it can be safely stated that the MSM is an entrenched and relentless enemy of Donald Trump, that doesn’t necessarily mean it’s an “enemy of the American people,” as Trump argues it is. Let’s be a bit more diplomatic and say it isn’t our friend. One yard stick for proving the claim is to consider the steadily mounting concentration of media holdings. In 1983, 90 percent of US media were controlled by 50 companies; today, 90 percent is controlled by the Big Six (AT&T, Comcast, The Walt Disney Company, 21st Century Fox, CBS and Viacom control the spoken and printed word from sea to shining sea). 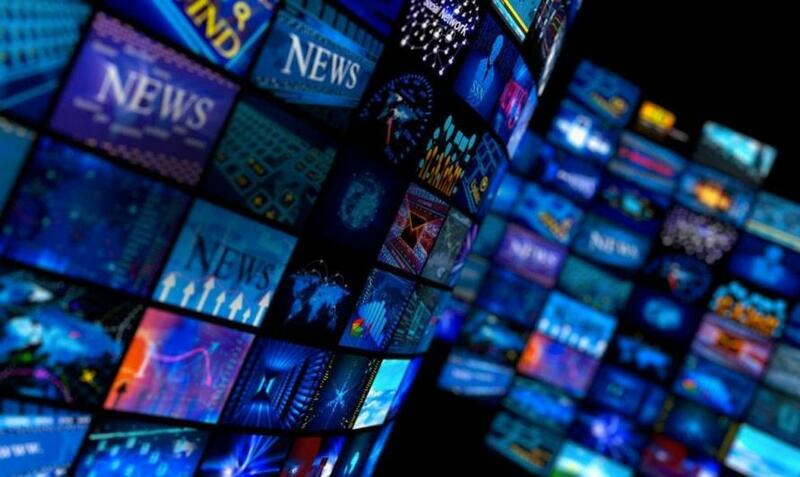 Although many people are aware of the monopolistic tendencies of the US mainstream media, it’s important to understand the level of concentration. It means the vast majority of everything you see and hear on any electronic device or printed publication is ‘democratically’ controlled by six average white guys and their shareholders. However, keeping track of who owns what these days is practically impossible since the dozens of subsidiary companies that fall under each main company are themselves fiefdoms, each with their own separate holdings. In fact, the already short ‘Big Six’ list is already dated, since National Amusements, Inc. has gobbled up both Viacom and CBS, while 21st Century Fox merged with Disney this year. As for the 350 US newspapers that penned tortured editorials decrying Trump’s critical opinion of them, many of those ‘local’ publications get their marching orders from either the Hearst Communications or the Gannett Company on the East Coast. Now, with this sort of massive power and influence lying around like dynamite, it stands to reason, or unreason, that the corporate and political worlds will succumb to the law of attraction and gravitation, forging powerful and impregnable relationships. It’s no secret that the politicians, our so-called ‘public servants,’ are mostly in the game to make a fast buck, while the corporations, desperate for ‘democratic representation’ to control regulation and market share, have an inexhaustible source of funds to secure it. Naturally, this oligarchical system precludes any sort of democratic participation from the average person on the street, who thinks just because he remembers to yank a lever once every several years he is somehow invested in the multibillion-dollar franchise. As far as media corporations being ‘private enterprises’ and therefore free to demolish the freedom of speech (even censoring major media players, like Infowars, simply because they whistle to a different political tune), that is quickly becoming revealed as nothing more than corporate cover for state-sponsored machinations. “In a corporatist system of government, wherein there is no meaningful separation between corporate power and state power, corporate censorship is state censorship,” writes Caitlin Johnstone. Meanwhile, it cannot be denied, from the perspective of an impartial observer, that the mainstream media is nearly always positioned to promote the government narrative on any number of significant issues. From the media’s unanimous and uncritical clamoring that Osama bin Laden was responsible for 9/11 (even the FBI has admitted it has no “hard evidence” that bin Laden carried out the attacks on the World Trade Center and the Pentagon), to its gung-ho enthusiasm for the 2003 Iraq War, to the sycophantic cheerleading for a war in Syria, the examples of media toeing the government line are legion. And if US intel is in bed with Hollywood you can be damn sure they’re spending time in the MSM whorehouse as well. Is it any surprise, then, that public trust in the US media is reaching all-time lows, while news consumers are increasingly looking to alternative news sites – themselves under relentless attack - to get some semblance of the elusive truth, which is the God-given right of any man? Truth is our due, and we should demand nothing less.